In recent months, the nation's capital has borne witness to a tale of two of its newspapers worthy of one of Charles Dickens' most famous novels. Call it "A Tale of Two Newspapers." With apologies to the 19th century British author, what's been happening to the two newspapers can best be described by the opening paragraph of Dickens' novel about events that transpired in London and Paris during the French Revolution. For one paper, it is the best of times. For the other, it is the worst of times. WASHINGTON BLADE MAKES A COMEBACK FIVE MONTHS AFTER SHUTDOWN. . .
On April 30, The Washington Blade, the capital's LGBT (lesbian, gay, bisexual and transgender) community weekly that had been the nation's LGBT newspaper of record for 40 years before it was abruptly shut down last November when its former parent company filed for bankruptcy, made a triumphant return to Washington-area newsstands and vending boxes with a new look and a new slogan -- "Still Sharp After 40 Years." A group of longtime Blade staffers formed a new, locally-based company to publish a new weekly newspaper for the city's LGBT community immediately after Atlanta-based Window Media, the Blade's parent company, filed for Chapter 7 bankruptcy and shut down all of its newspapers, including the Blade. The new newspaper published under the name DC Agenda. The new company, Brown Naff Pitts Omnimedia, Inc., was founded by Blade Publisher Lynne Brown, Editor Kevin Naff, sales executive Brian Pitts and other longtime Blade employees. Meanwhile, across town, Washington's longtime conservative daily newspaper, The Washington Times, is tottering on the brink of extinction following months of turmoil after the Unification Church, which owns News World Communications Inc., the Times' parent company, cut off its $35 million-a-year subsidy to the newspaper, amid a bitter feud among the children of the church's 90-year-old founder, Reverend Sun Myung Moon. After sinking more than $3 billion into the newspaper it launched in 1982, the Unification Church has put the Times up for sale. But the paper has never turned a profit in its 28-year history and loses upwards of $80 million a year. Moreover, the Times' paid circulation, which posted an anemic 67,000 in its last report to the Audit Bureau of Circulations last September -- compared to the rival Washington Post's 702,000 -- plunged dramatically since the crisis began to 42,000, with only 25,000 home subscribers, according to Times sources who spoke to The 'Skeeter Bites Report on condition of anonymity. For the Blade, its phoenix-like rise from the ashes of Window Media's bankruptcy is a rare instance of good fortune in an industry that has suffered -- and continues to suffer -- staggering losses. Figures released in April by the Audit Bureau of Circulations, which monitors newspaper sales to the public, found average weekday circulation fell 8.7 percent in the six months that ended March 31, compared with the same period a year earlier. Circulation of Sunday newspapers also fell, by 6.5 percent. Even free-circulation newspapers, most of them weeklies, have seen declines in both circulation and advertising revenues. The Blade was no exception to this trend, but has remained financially healthy, according to publisher Lynn Brown. Over its 40 years, the Blade built a reputation as the newspaper of record if you wanted to know the latest news of the LGBT community in the nation's capital and around the world. With its straightforward, no-nonsense, in-depth style of reporting, the Blade became known as "The New York Times of the gay press" -- the one LGBT newspaper that the mainstream media -- and much of Washington's heterosexual society -- took seriously. On November 15 -- just weeks after it celebrated its 40th anniversary in October -- the Blade's nearly two-dozen employees arrived for work at the newspaper's offices in the National Press Building in downtown Washington and were stunned to be told by an executive of parent company Window Media that the company had filed for liquidation under Chapter 7 of the U.S. Bankruptcy Act and was shutting down all of its publications. Staffers had until 3 p.m. that afternoon to clear out their desks. The Atlanta-based Window Media, which purchased the Blade for a reported $2 million in 2001, was also closing the Southern Voice of Atlanta, the Houston Voice, the South Florida Blade of Miami and several magazines. The Blade's Web site, washingtonblade.com, was also shut down. A Window Media spokesman did not disclose a reason for the sudden shutdown, but it had been known for months that the company was saddled with major debts. Ironically, the Blade itself was financially healthy, with a weekly circulation reported at about 25,000 and its average 80-to-100-page issues thick with advertising. Its Web site was even more successful, drawing about a million visitors a month. Founded in October 1969, just four months after the Stonewall Riots in New York's Greenwich Village that is credited as the beginning of the modern gay rights movement, the Blade -- originally named The Gay Blade -- first rolled off a mimeograph machine as a four-page newsletter. Determined to preserve the Blade's 40-year legacy, a group of Blade employees, led by Brown and executive editor Kevin Naff -- with the backing of many businesses and LGBT community organizations -- launched DC Agenda to fill the void left by the Blade's sudden demise. 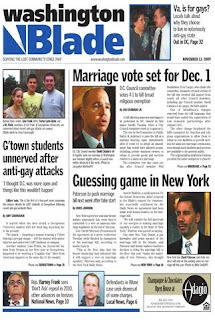 Without missing a week, on November 20, the first issue of DC Agenda hit the streets on what would have been the first Friday without the Blade. The newspaper's staff formed Brown Naff Pitts Omnimedia Inc. to buy the rights and assets of the Blade. They succeeded in late February, when the fledgling company purchased the newspaper's name, copyrights, trademarks, 40-year-old archives, computers and office furniture under the auspices of the U.S. Bankruptcy Court in Atlanta for $15,000. On April 30, 25,000 copies of a new, redesigned 56-page Blade rolled off the presses. "A lot of people really have an emotional connection to the Blade and the outpouring since it closed was overwhelming and was really what led us to carry on," Naff told The Washington Post..
"We'll be a leaner publication and we'll grow as we can afford to grow," Naff continued. "But [this first] issue is 56 pages -- which is remarkable considering [that] DC Agenda launched with just eight pages." It's a totally different story at The Washington Times offices on New York Avenue in northeast Washington. On the very same day that the Blade made its return, it was announced that the Times was up for sale. Nicholas Chiaia, a member of the conservative daily's two-person board of directors, announced the sale just as Times president and publisher Jonathan Slevin was shown the door -- the second chief executive of the newspaper to be fired in five months. Slevin was named the Times' president and publisher last November after his predecessor, Thomas McDevitt, along with longtime chief financial officer Keith Cooperrider and board chairman Dong Moon Joo, were fired personally by Preston Moon, president of parent company News World Communications Inc. and the youngest son of the company's founder, the Reverend Sun Myung Moon. The chaos at the Times began in October, when the Unification Church announced that the 90-year-old Reverend Moon, who founded the church in 1954, was essentially retiring, turning over control of the church and his global business empire to his three American-born sons. Hyung-jin Moon, 30, was put in charge of the church itself. Kook-jin (Justin) Moon, 39, was tapped to run the church's businesses ventures in South Korea. Hyun-jin (Preston) Moon, 40, runs the church's overseas businesses -- including News World Communications. There have been numerous reports -- most notably on TalkingPointsMemo.com -- of a bitter feud between Preston and the rest of the Moon family. IS POLITICAL SPLIT ROOT OF MOON FAMILY FEUD? The reason for the feud is not known, but according to a Wikipedia page about the new Unification Church leader, Hyung-jin Moon is said to have broken from his family's longtime support for conservative Republicans to back President Obama. "I am very proud as an American to have a black president," he is quoted by Wikipedia as saying. "I was born and raised in America. I am a part of a minority. To see a minority representative being the president of the United States of America is extremely inspiring. It's just miraculous." The 'Skeeter Bites Report was unable to independently confirm the quote. Whatever reason for the feud, it apparently led Hyung-jin Moon in October to cut off the church's subsidy to keep the Times afloat -- a hefty $35 million a year. In its entire 28-year history, the Times has never made a profit and, according to Times sources, loses between $75 million and $80 million a year. The results have been disastrous for the paper. With the church's largesse -- which reportedly totals $3 billion since the Times was founded in 1982 -- now dried up, on top of sharply declining advertising and circulation that has plagued newspapers from coast to coast, Preston Moon was forced to drastically cut costs in a desperate attempt to keep the conservative daily alive. In quick succession, more than 60 percent of the Times' staff was laid off -- far more than previously reported. The paper stopped publishing on Sundays, becoming a Monday-through-Friday daily only, much like USA Today. But the most radical cutback, however, was one that Times readers noticed right away: It ceased to be a full-service daily, eliminating its metropolitan news and sports sections. In particular, the end of the Times' highly-regarded sports section -- it published for the last time on December 27 -- might have been the final straw with readers: Circulation plummeted, from 67,000 last September to 42,000 now, according to Times sources. Home-delivery subscriptions nosedived to 25,000. Even the Times' Web site saw a dramatic decline in visitors. The capital's conservative community -- the paper's core readership base, as well as many of the paper's longtime conservative columnists -- abandoned the Times in droves, with many switching to the Washington Examiner, the city's other conservative daily owned by billionaire Phillip Anschutz's Clarity Media. Now, the Times is up for sale. But given the fact that it's never made a profit in its 28-year history; it loses up to $80 million a year; its circulation has dropped like a stone; and the economic climate for daily newspapers appears to get worse by the month, who in their right business mind is going to buy it? Certainly not Rupert Murdoch, whose News Corporation owns a highly profitable television station in Washington (WTTG Fox Channel 5) and FCC cross-ownership rules would bar a purchase of the newspaper without selling off the station. Besides, Murdoch already owns a money-losing newspaper -- the New York Post -- which hasn't made a profit in 36 years and loses an estimated $55 million to $60 million a year. Murdoch can't really afford to subsidize two money-losing dailies. Unlike Reverend Moon, Murdoch has News Corporation shareholders he has to answer to -- and they would not likely be happy with such a purchase. The Washington Times is, for all intents and purposes, in a coma. It would be very surprising if the paper isn't gone by September, if not sooner.